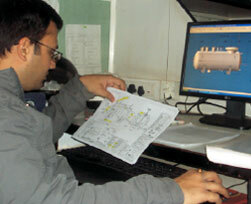 At Chem Process Systems, we employ a variety of computerized, manual, thermal and mechanical design techniques to design tailored installations. Our Research Centre plays a considerable role in the final design of many installations of Chem Process Systems, particularly in establishing viability of concentrating, crystallising, centrifuging and drying a wide range of products. Pilot plant trials are conducted to determine product heat transfer coefficients and to evaluate product characteristics during actual process operation. Furthermore, having access to the Heat Transfer Research Institute (HTRI) software ensures that we have access to the state of the heat transfer industry at the highest possible level. Our design team is available for our customers, to provide support and advice, prior to order placement and following installation.